France This Way comment: Saint-Paul-de-Vence is small, and also one of the most beautiful and most visited villages in France. It is best summed up by the sign at the entrance to the village itself which reads 'authentic and touristy, quiet and buzzing, Saint-Paul is proud of its paradoxes - they are the key to its charm and identity'. I certainly couldn't put it better myself! 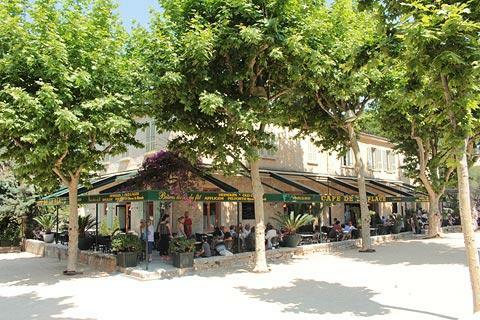 Before you reach the historic centre you pass a large open square with cafes and a large boules court. 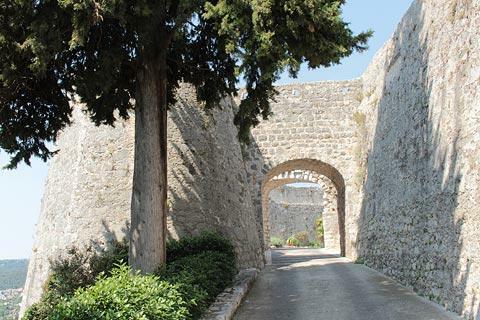 You then enter the historic village through an original stone gateway through the defensive ramparts, the Porte du Vence, built in the 14th century. 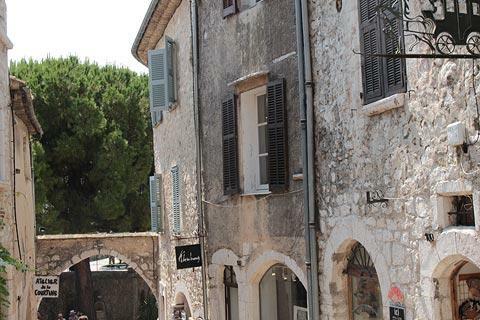 Saint-Paul-de-Vence tourist office is just inside this entrance and can provide you with a map that shows all the most important historic highlights. 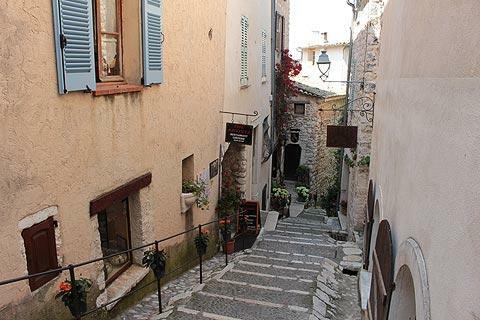 The village consists of one long, narrow and cobbled street that runs from one end of the village to the other, called the rue Grande, with a couple of small side-streets to also explore as well as the historic monuments around the Place de l'église. 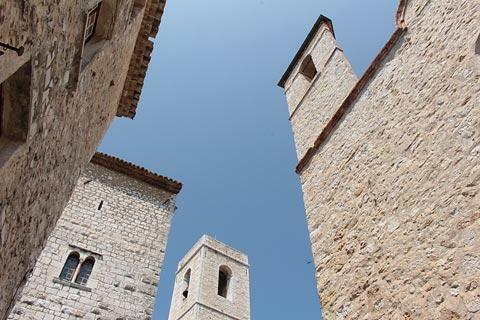 As you explore you also get the chance to enjoy glimpses of the views over the surrounding countryside and the many attractive medieval houses and attractive facades. Be sure to pay close attention to the houses to see the interesting architectural features such as statues niched within the walls. 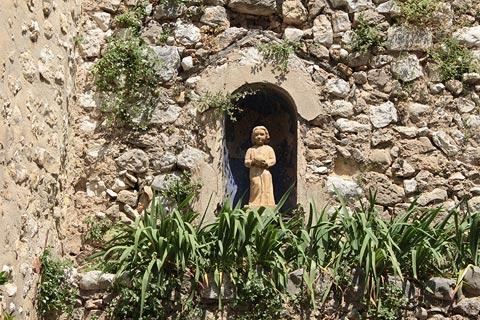 The beauty of the perched village of Saint-Paul-de-Vence has attracted many artists during the last century - starting with Modigliani on the 1920's - and it now has a very high reputation as an artistic village, as well as a place of great natural beauty. 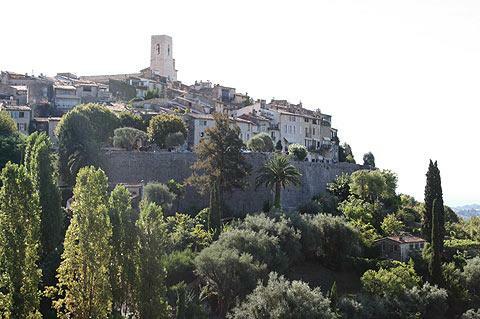 Picasso, Braque and Miro are among the well known artists who stayed at Saint-Paul-de-Vence. 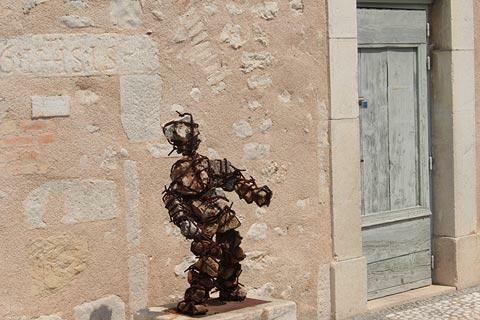 This artistic tradition continued into the 1960's when the village was host to many renowned French film actors and directors. 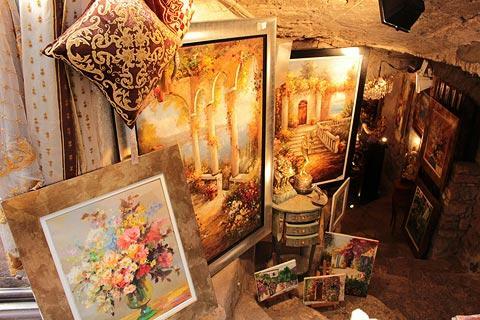 Many of the artistic community, when less well known, stayed and eat at the Colombe d'Or hotel - which frequently accepted works of art as payment in kind, and now has one of the finest private art collections hanging on its walls! 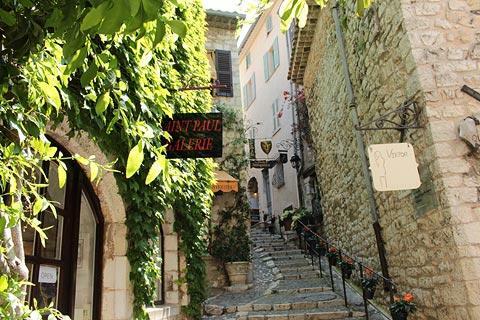 Not surprisingly there are a large number of cafes, boutiques and especially art and craft shops so you can take your own piece of Saint-Paul-de-Vence art home with you. 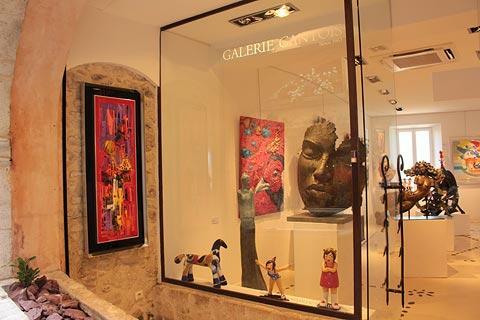 The 'art connection' of the town means that a very high quality of art gallery are to be found here, especially along the first section of the main street and art enthusiasts will take great pleasure in window-shopping. About halfway along this street you can see the 'Grand Fountain', built in 1850, and at the far end of the rue Grande there is a belvedere where you can best appreciate the views, and also the cemetery where the artist Marc Chagall is buried as well as the Porte de Nice, another of the historic entrances to the village. If you follow the stairs to the right of the Grand Fountain you reach the Place de l'Eglise. 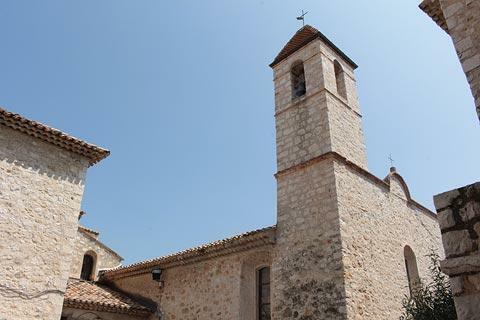 This is a pretty square with a 12th century tower, the town hall for Saint-Paul-de-Vence, the 17th century Chapel of the Penitents Blanc with its walls decorated by local artist Jean-Michel Folon, a baroque chapel and the collegiale church, with its origins in the 13th century. 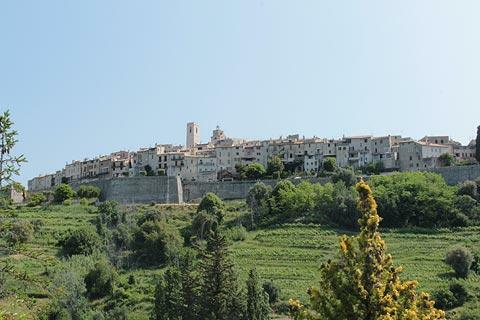 From here you can explore the narrow streets that surround the place de l'Eglise, and after exploring the centre of the village you can follow the ramparts along the north and south sides of the village with far-reaching views in both directions, across the vineyards and as far as the Mediterranean. 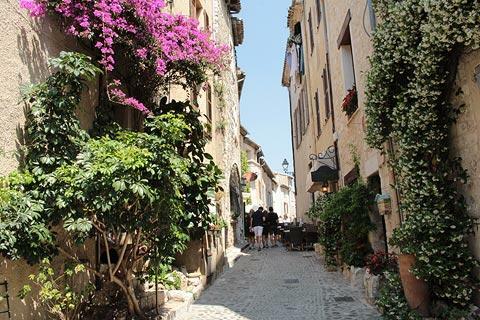 Note: busy even by the standards of 'beautiful Provence villages' it is said that more than 2 million visitors come to Saint-Paul-de-Vence each year. This is a lot for a small village! Do try and get here early if you hope to take photographs without too many visitors! The artistic legacy has also given rise to an especially fine art museum on the edge of Saint-Paul-de-Vence called the Fondation Maeght. 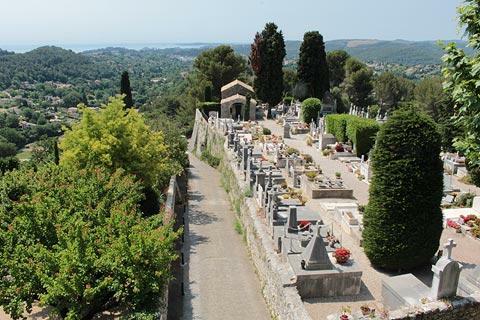 This modern art museum (founded by a family of art dealers from Cannes) features an exceptional collection of painting, sculptures and artworks of the 20th century - the areas featuring Miro sculptures and Giacometti sculptures in natural settings are among the many highlights. See Fondation Maeght. 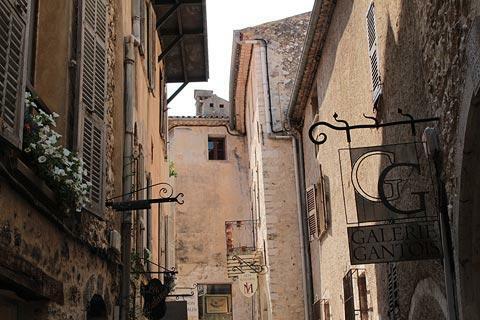 You will certainly also want to visit the small town at Vence, just a short distance from here and with a lovely historic centre to explore.